After an enigmatic introduction to something dreadful which happened at a remote cottage in the woods, we are introduced to Quincy Carpenter who is a successful baking blogger with a swanky New York apartment and a loving partner. All would be perfect except that Quincy is one of those interesting characters who has survived a horrific massacre. Dubbed by the media as a Final Girl, Quincy is only one of three such massacre survivors who, in recent memory, walked away from violent bloodshed. When news reaches Quincy that one of the other survivors has taken her own life, it opens up a whole series of memories which she has long since buried. What then follows is a taut psychological suspense story which focuses on Quincy's life in the here and now whilst at the same time giving us flashbacks to what actually went on at Pine Cottage. The story is an interesting observation into how people go into survivor mode and how the brain locks down painful memories in order to protect itself. Whilst Quincy thinks she is coping reasonably well, the terror of her past traumatic experience is never very far away. Throughout the story the author does a really good job of cranking up the tension, particularly when the other final girl makes an appearance. This really shakes things up and takes the story in a whole different direction. 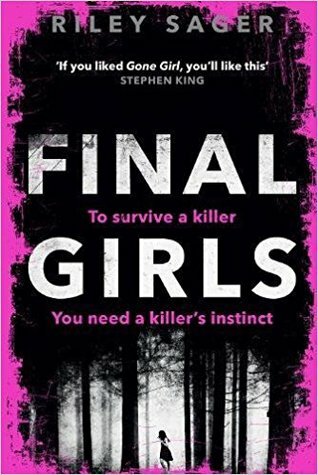 Final Girls is a cleverly thought out psychological thriller with more than enough twists and turns to keep you guessing and although I did sort of work out where the story was heading, I certainly enjoyed getting to understand Quincy's complex character and of seeing just how the story would eventually play out.